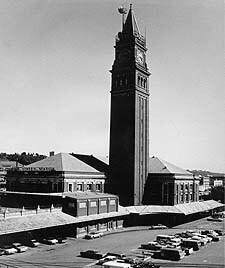 King Street Station documents Seattle's development into the major transportation center of the Pacific Northwest. In the years following the Civil War, western towns like Seattle competed fiercely to attract railroad service. They recognized the incredible economic benefits that could arise when serving the country's dominant form of transportation. For more than 20 years the city tried but failed to become part of a transcontinental line. The Northern Pacific transcontinental line terminated in Tacoma, Washington, in 1873, but despite repeated attempts by Seattle to build its own branch connection the city remained isolated well into the 1890s. At that time, James J. Hill decided to extend his Great Northern Railroad to Puget Sound in order to build up trade to Asia by joint use of rail and ship. Towards the end of the decade the Northern Pacific, the Great Northern's chief rival, proposed building a huge depot just blocks from Puget Sound. City fathers rejected this plan, fearing it would cut off the downtown from the harbor. In 1902, the Great Northern and the Northern Pacific agreed to share a 5,245-foot tunnel underneath Seattle's business district and to build together a new terminal where the tunnel emerged near King Street. The tunnel took three years to build, but the 1906 station became the most obvious evidence of a project which, by improving Seattle's connections between land and sea, helped establish the city as the region's primary shipping port, a position the city still holds today. The King Street Station-- with its deep red brick construction, high ceilings typical of grand railroad terminals and tower design derived from the Piazza de San Marco's campanile in Venice, Italy--remains an impressive building that still serves passenger trains. King Street Station is located within the Pioneer Square-Skid Road Historic District at the corner of Third Ave. and South King St. King Street Station is open to the public; visit Amtrak's website for further information.